In 2001, two important events happened in the life of Iraqi American entrepreneur Ben Kacyra. The first, a happy event, was the acquisition of his terrestrial LiDAR startup. His company had brought to market the first integrated hardware and software solution to very quickly and accurately map our complex built environment. The second event transported him back to his childhood in the Middle East as he watched on television as the Taliban destroyed the Buddhas in the Bamiyan valley. He remembered the ancient Mesopotamian ruins just outside his home city of Mosul, and wondered about their fate in the coming years. He felt compelled to do something. The LiDAR technology his company had just developed was still in its infancy, but Ben saw an opportunity to utilize the technology outside its current industrial applications. He began to talk with his wife Barbara about expanding the mission of their family foundation to apply the 3D capture technology to create and archive of the world’s historic monuments. CyArk was officially formed in 2003, with the mission to capture, archive and share the world’s cultural heritage. This ‘Cyber Ark’ was to serve as a record of these places in the event of catastrophic loss, so the data could be used to aid in recovery efforts or as a minimum serve as a record of the site. The archive could also be a resource for people managing the sites today and those interested in learning more about these places. CyArk matured alongside the tools in the reality capture field. As laser scanners became both faster and cheaper, CyArk was able to document larger sites and at an increased level of detail. In the beginning CyArk worked closely with the 3D scanning community to collect data sets around the world, often through volunteer efforts from survey firms and universities. Later we began to incorporate photogrammetry into the process using high resolution cameras and drones to capture the color and texture of surfaces alongside the geometry captured by the laser scanners. The advancement in capture technologies allowed CyArk to amass a large archive of cultural heritage data but there were still challenges in terms of access and utilization. Recently we began a journey to address some of these obstacles in an effort to truly meet our vision of inspiring wonder and curiosity and fostering a shared understanding of our past. To do this we had to solve the accessibility problem, providing seamless access to the source data sets and allowing researchers, academics and the broader heritage community to derive value and create knowledge from them. We also worked hard to create useful derivatives of this high resolution raw data that would be critical in solving near term conservation and preservation problems that many of these sites face today. And finally we explored ways of truly immersing people in these places, taking advantage of the full resolution we were capturing and the emergence of mediums such as Virtual Reality that could transport users and instill a strong sense of place. From our work at Bagan in Myanmar, we were able to create a detailed set of architectural drawings to support the stabilization and conservation efforts at the Ananda Ok Kyaung temple. The building is the focus of a UNESCO pilot project on how to best conserve monuments impacted by the 2016 earthquake. Derived from a photo-realistic 3D model, ortho-elevations and sections were presented in CAD and provided the foundation for analysis by a structural engineering firm that developed a strategy for the conservation of the building and its fragile murals. This same data also became the basis for a lab experiment by Google Arts and Culture which provides an interactive and immersive tour of the site with detailed commentary that is available in the browser or fully immersively via Google Daydream. Wat Phra Si San Phet is the most sacred of sites in the UNESCO listed Historic City of Ayutthaya. It contains three large bell shaped chedis which have become a symbol for Thailand. Like much of the site of Ayutthaya, Wat Phra Si San Phet was inundated during a major flood that affected Thailand in 2011. As a result the chedis are undergoing additional subsidence and the Thai Fine Arts Department and the UNESCO Bangkok office collaborated with CyArk to create an accurate drawing set of the site. The drawings were used to determine the exact lean of the chedis and to create an accurate snapshot that will be used as a reference to monitor the monument into the future. The source high resolution 3D model was also used as the basis for a navigable environment in CyArk’s first VR application, MasterWorks: Journey through History. This free app for Oculus Rift and Samsung Gear VR, transports users to Ayutthaya where they can explore Wat Phra Si San Phet in an open environment and learn about the site, its history and current conservation challenges from UNESCO and the Fine Arts Department through audio clips and objects. These recent projects start to deliver on the full promise that Ben and Barbara Kacyra envisaged when they founded CyArk 15 years ago and with the launch of our Open Heritage initiative we now get to unlock the potential of this data fully by putting it into the hands of others. With the support of Google Arts and Culture we are now able to make our library of 3D cultural heritage data broadly accessible to the public. Today we are releasing an initial set of projects that have been curated for launch and we are committed to adding as many sites as possible from our library over time as well as new sites as they are captured. The data is comprised of LiDAR and photogrammetric images and is being made available through a self serve platform powered by Google Cloud Platform. Anyone with an interest can request the data through a simple form and receive a Creative Commons Attribution-NonCommercial 4.0 International License. 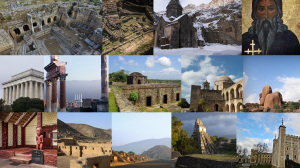 CyArk has accomplished some incredible things in the 15 years since it was started, capturing data on hundreds of sites on all 7 continents, empowering local stakeholders with better information to make decisions about the sites they manage in order to safeguard them for future generations, and now providing access to these incredible sites to anyone, anywhere with an internet connection. As we close the loop on this final important component of our mission, it feels more like a beginning rather than a completion. There is an incredible power in sharing this information with a broad community and we can’t wait to see what they do with it.